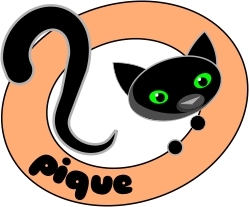 Progress is being made on the Pique front. I’m really not a web designer, so the website is going… slowly. Business cards are on hold until I know what my URL will be. I think I have it picked out, but I need to actually go ahead and purchase it. 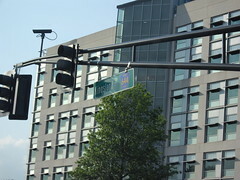 The only one it looks like I’ll be able to get is a .net address, though, which I’ve always been hesitant towards. I do honestly believe that .coms are better for marketing purposes, but we’ll see. The problem is that there are so many squatters out there! I looked at four different URLs involving pique, and all of them are taken by placeholder pages, which is frustrating to say the least. I’ve started work on September’s calendars. 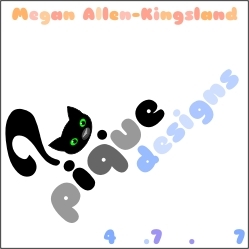 I’ve got two designs completed so far. The goal is to have four each month, so that those of us who like to change wallpaper once a week have some variety. They’ll be announced the last week of August. 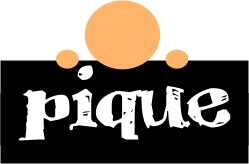 But I was on the phone with Lei today, and she expressed enthusiasm for one of this month’s designs, so I thought I’d share the very first Sneak Pique. One of the blogs I used to read frequently was from a website designer who used to have posts every now and then asking his readers what they were currently working on. He asked for a 300×300 pixel square of the work in progress. I thought these were fascinating to see. 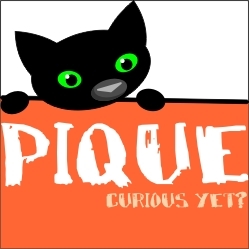 So, as part of the regular features of Pique, as well as to keep me on task as much as possible, I would like to borrow the idea and make myself publicly accountable for what I’m working on. 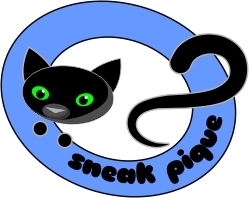 And, in the tradition of punsters everywhere, I would like to call these “Sneak Piques”. So this is the first. It’s one of the September wallpapers, which you will get to see next week. I’ll be releasing the wallpapers as 1280 x 1024. If you’d like them in another size, please just comment here and let me know what size you’d prefer. I’m toying with the idea of a phone-sized wallpaper, too. When we last left off, I had a lovely design that I was starting to be quite happy with. Okay, great. Next step: confirm the usage rights on the font. Usually, I don’t download fonts I can’t use commercially, but sometimes I mess up and download a “Free for Personal Use Only” font. So let’s just check. This one is called Scrubble, and it is… well, crap. Personal Use Only. That figures, right? Oh well. Time to find a new font. One of my favorite resources is Dafont.com, as you may have noticed from the previous post. All the fonts there are free and of pretty decent quality. One day, I might be able to afford to actually purchase fonts, but not until this design business actually takes off. In the meantime, I am dependent on the kindness of strangers, if you will, which is why I’ve made sure to attribute and link to each font I’ve used. Putting together a font is a lot of work and I have mad respect for the people who choose to do it. I’ve tried. I’ve never gotten past e before. SoupLeaf: really awsome, but not for this project. 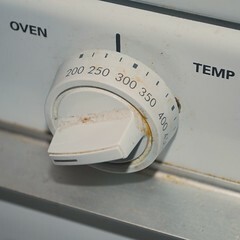 Download and place on back burner. Coldbringer seems a little too… violent. That leaves four. I really liked that Scrubble had a lowercase serif, which none of the rest do. They’re either serif or lowercase, but not both. Well, it looks like I can skip B, F, J, R, V, W, X, Z, and the numbers 1, 2, 6, 8, and 0. Half an hour later, and all I have is a single letter. I’m not even sure if I like it. I’m just too tired to care. My body temperature has risen, my blood pressure must be through the roof, and all I want to do is email El Stinger and start throwing money at him. But the comment on that site makes his views on commercial uses pretty clear, so I begin browsing again. First I try out an old favorite, FFF Tusj. I used this font for some of the wedding related material, and I do really like its effect. Unfortunately, Corel Draw doesn’t like it very much, and it’s difficult to work with because of that. More importantly, even when I add a nice, thick outline, it’s just too severe. Scrapped before I even export a screenshot for you. Marky Marker, Sketchy, and SoupLeaf. All seem to be decent options (despite my earlier comments about SoupLeaf being totally wrong for this project, I had to try it anyways. It pleases me). But I need to stop working for the day and get food packed up for the show tonight, so I will let these sit in the back of my brain and look at it again tomorrow. Sometimes, all these things need is a little time. I’m currently in the process of putting my design business together into a meaningful thing. Since what I aim to do is to help people discover and refine their own brand and visual identity, I am quite literally my own first customer. 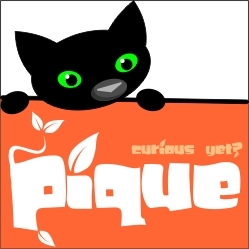 So here’s a little peek (pique?) into my process. This involves a lot of questions. Who are you? What do you want to accomplish? What do you have to offer? What are your goals? I might come back to what my own answers were later, but I think it’d be more interesting for the moment to skip ahead to the next step. Creating a visual identity. Ah, here’s the part where I get to show you pretty pictures. I don’t have any of my sketches scanned at the moment (those will be added later), so we’ll start with the first steps at the computer. I like to start by playing around with text. 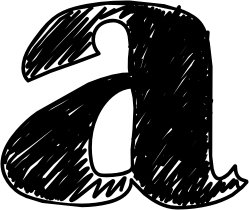 I like the way words look, and I frequently find my inspiration through the shapes of letters. 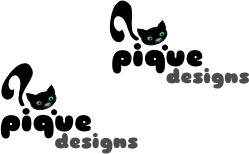 So I began by taking the name of the company, Pique, and playing with fonts. As Ben will tell you, I am a font addict. He thinks I have thousands. In reality, I cut back a whole lot after college. Did you know that if you have 450 fonts installed, your computer slows to an unusable crawl? I now try to keep my currently installed collection around 200 (although, right now my notes show me I’m at 286). Above, you will see Fontdinerdotcom Sparkly (minus the sparkles), Century Gothic, Triforce, Ubuntu Title, and Sniglet. After some playing, I really liked the friendly look of Sniglet. 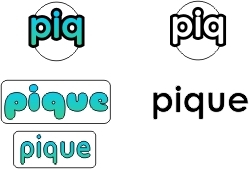 Pique is a word that, if placed in all caps in some of the wider fonts, can have a fierce look. 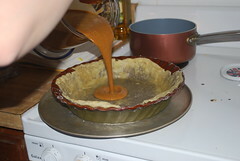 Sniglet helped it feel softer and more approachable. So I played from there. Well, okay, I didn’t completely stick with Sniglet yet. I played with the fonts some more. I tried removing the “ue”, and it looked like a strange face. So I made it a face. And I stuck the word in a box. And felt like I was getting nowhere. As with most of my designs, the next step was sort of inscrutable. I decided to try Lilit as a mascot. So I made a cartoony cat and stuck her in a circle. Okay. Now we’re getting somewhere. Some further refinements to the cat and a change in direction. Note the paws and head shifted to be more active and the tail a little less droopy. A change in color to my signature orange (although a bit too pale, I think). The tail still isn’t right, and it doesn’t shrink down very well yet. But still, progress nonetheless. Let’s try losing the circle and fixing the tail. I’ve always loved how an inquisitive cat’s tail resembles a question mark. 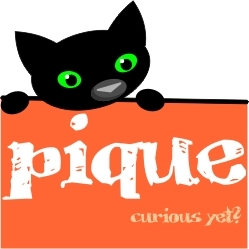 One of the connotations of Pique that we’re trying to emphasize is “pique your curiosity”. I positioned the cat so she was “peeking” over the name. I also played around with question marks, using one of the paws as both the dot of the question mark and the dot of the i. Good, but it now looks like ?-catface, as opposed to a tail. Tilt the tail to use the head as the dot… better, but still it looks too amateurish for my tastes. Well, let’s play with a business card design anyways. There’s a very real trend in design right now for colorful, playfully cluttered designs, so I wanted to try my hand at that. Ugly, isn’t it? I don’t like it one bit. Okay, okay. Start from scratch. At its absolute bare element, what do I want to say? So how about a face popping up and “peeking” at the name? Let’s bring the cat back. And what’s with the pastels? Let’s get some real color in here. I’m starting a new mini-project for myself. 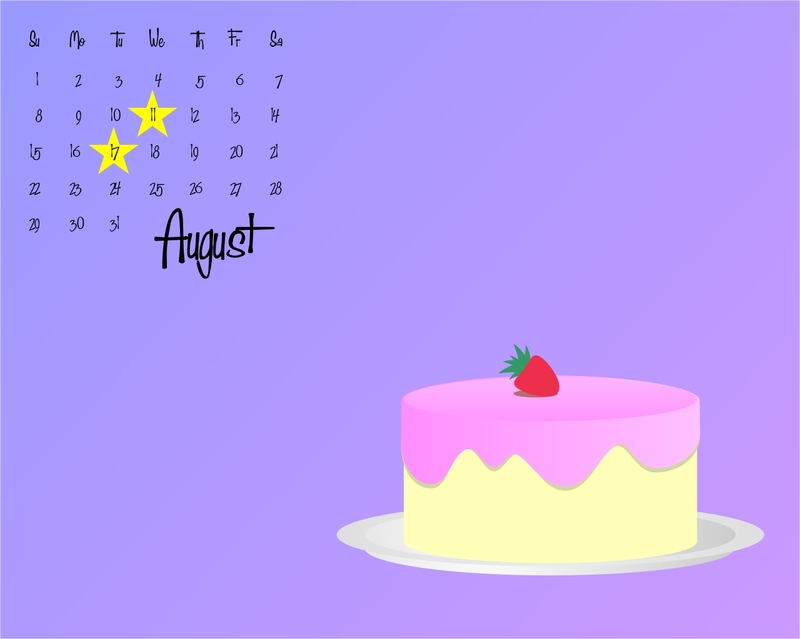 To help me get my design skills back up to snuff, I decided to make a few wallpapers with a calendar for each month. 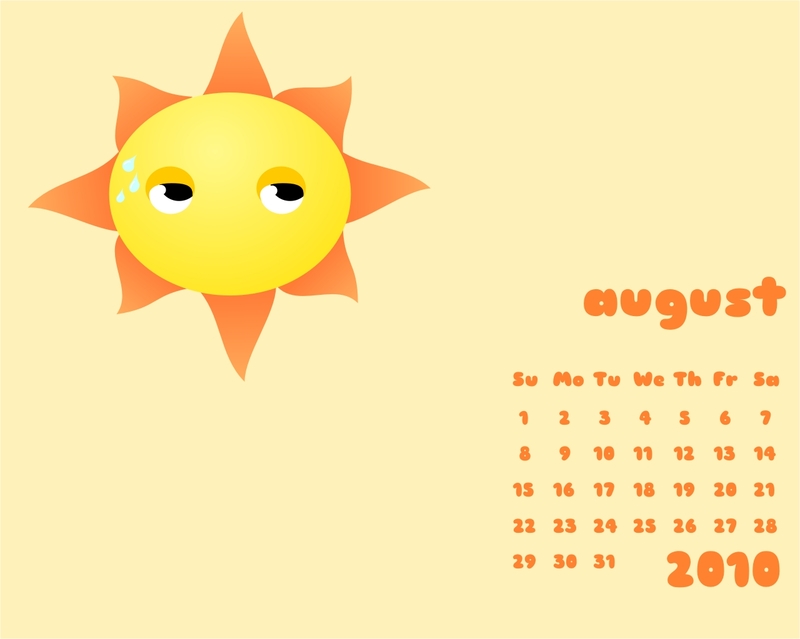 Here’s three to get August started.